Previous edition: Haywards Heath: Tottel, 2007. Local Government Contracts and Procurement, Third Edition is a truly accessible guide to the complex regulatory regime governing local authority contracting and tendering. 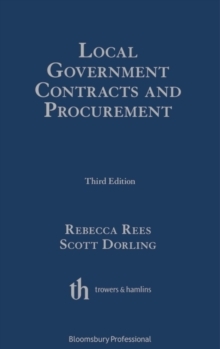 The third edition will guide the reader easily through the key stages of a local government procurement exercise, providing detailed coverage of preparation; tendering; selecting; UK and EU constraints, and negotiating and managing commercial contracts. Fully revised and updated, Local Government Contracts and Procurement 3ed provides: Coverage of the implication and application of new procurement Public Contracts Regulations 2015 New case studies including joint ventures, trading companies and mutuals This user-friendly book will act as a day-to-day reference work, providing easy access to topical case studies, contents and sample clauses, useful advice on drafting techniques and a discussion of contractual principles. This is essential reading for everyone advising on or involved in tendering, selecting, negotiating and managing commercial contracts in local government.